3,000 feet of smooth trackwork. And in addition to that, the designing team's practical concepts included comfy, high-capacity trains accommodating four riders per row as opposed to the traditional two. From opening day forward, Iron Wolf proved a hit withGreat America guests. The word was out, and Bolliger and Mabillard's reign in the coaster business was officially kicked off. At a height of ten stories and with speeds reaching fifty-five miles per hour, Iron Wolf's statistics were nothing to write home about, but the stand-up aspect of the ride was a novelty that became a true draw, along with unprecedented smoothness and comfort for a steel coaster. Standing straight up with well-padded over-the-shoulder restraints to hold them in, the twister's layout swept passengers through nine completely different curves along with a duo of inversions in the mix of elements: a vertical loop following the first drop, and a corkscrew flip after mid-course brakes. After over two decades at its home though, the Wolf's time at Great America ran out. Perhaps it was the cursed land that the ride presided over, which was once home to another B&M first, its joint-project with Intamin known as Z-Force. That coaster was moved after only a few years to Six Flags Over Georgia, and then Six Flags Magic Mountain, where the coaster stood dormant after 2003 before being scrapped and demolished in 2008. Finally, after months of rabid speculation of the rides departure, the park announced on August 5, 2011 that the coaster would be taking its last riders around Six Flags Great America on September 5--the day of "Iron Wolf's Last Stand." Just a few weeks later, Six Flags America announced that it would be adding a "new" coaster for the 2012 season, and so the speculation began. As clues were revealed and documents about the new coaster were uncovered by hungry enthusiasts, evidence seemed to point towards the new coaster being Iron Wolf. 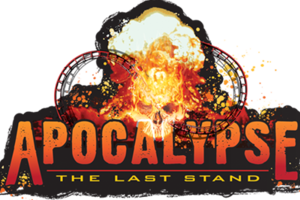 On September 1, 2011, just days before Iron Wolf's "last stand," Six Flags America announced that it would be the recipient of Iron Wolf in the form ofApocalypse: The Last Stand. With land at a premium, the park made the decision to remove its Skull Mountain attraction, opening up a plot of land large enough for the coaster to fit. Now themed to a much darker black and burnt-orange color scheme, thrill seekers step out onto the train to board, first straddling small 'seats' and then pulling yellow harnesses down to secure to seat belts. After the boarding process is complete, the train starts on its way from the building with a bank and slight dip around to the left through a support, then an ascent while the track makes a U-turn to the lift. Grabbing onto the chain, the train starts climbing to the top of the 100-foot slope. Passengers on the left side of the four-abreast train can get a peek at what's to come down below: a vertical loop, a tasty swooping turnaround, and spiral up through the loop. Over the crest, the track dips, levels, and makes a left bank. Riders are taken down a 180-degree-curving first drop back to ground level as they gain some fifty-five miles per hour to push the train on its way up through the first of two inversions. Passengers climb skyward on their backs and flip through the top of the loop, then dive from the inversion facing the ground before pulling out. The red track starts curving rightwards up a fan curve turnaround over the first turn and station, and dives down banking and curving the opposite direction. Riders now find themselves at the bottom of an upwards spiral, and curve to the left around the loop, then up through the inversion to complete a helix of over 400 degrees. At the top, the coaster hits a few brakes when it passes over a mid-course block brakes section parallel to the lift and then starts down a banking dive under the first drop. Now passengers are immediately whisked up through Iron Wolf's corkscrew, then continue in the same direction with a turnaround at the far end of the coaster's layout. Another left curve and then a 315-degree downward turn takes the layout venturing around the dive from the brakes, and from there, it's one more turnaround up through the corkscrew flip and onto the final run of brakes.